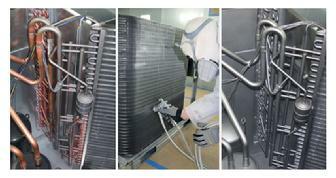 When time is critical, a field-applied spray coating may be the right solution. Luvata Insitu® is a permanent, water-based, synthetic coating developed specifically for the protection of heat exchange units. It can be applied quickly at our facilities or on site. While this technology does not match complete immersion, factory-applied ElectroFin® E-Coat process, a spray-applied coating does provied a level of protection that is better than no coating at all. Applied by certified technicians, the coating is fast drying, with only a single application required. Luvata Insitu® contains ES2 (embedded stainless steel pigment) technology, an anticorrosion coating specifically designed for the protection of the coils mounted in corrosive areas. Coils will have a permanent water-based synthetic coating with ES2 pigment applied to all coating surface areas without material bridging between fins.